Up to this point, we have done fairly well with adhering to our $25 grocery budget, and we began this week’s shopping trip feeling optimistic, but because my work schedule has been crazy, I didn’t have the opportunity to really think and plan before heading to the grocery store. Instead, I headed to the store without a plan, and I hadn’t consulted my family regarding what they might like to eat during the coming week. As a result, things didn’t go as planned. 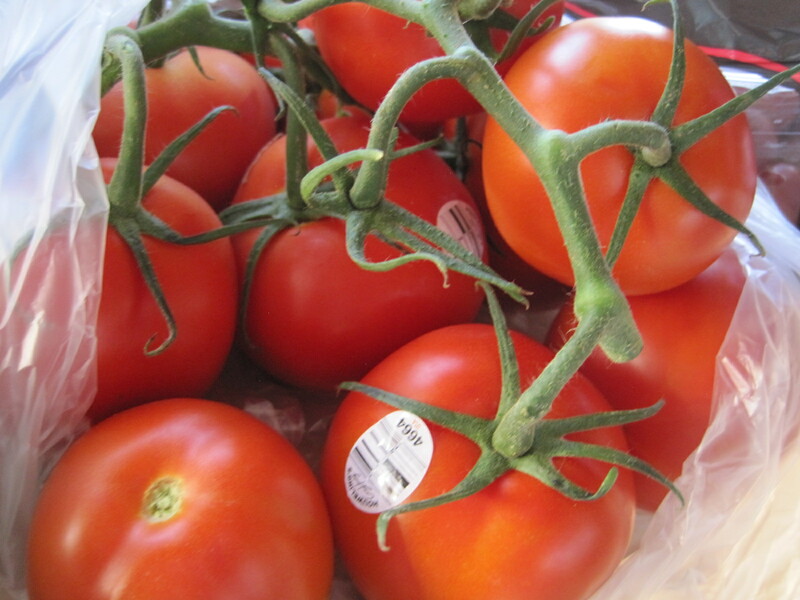 I studied the sale papers, and since I would be in a neighboring community, I planned a trip to Vallarta on Wednesday to catch the produce sales. 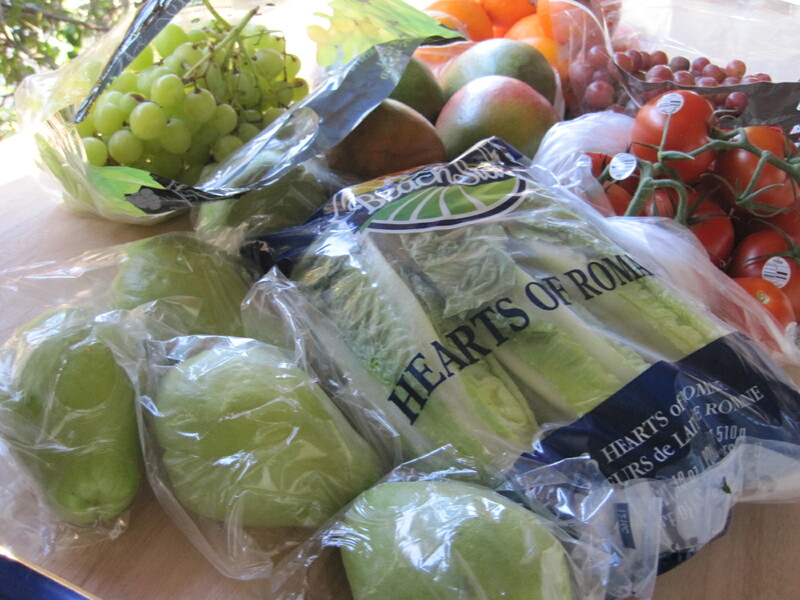 I purchased over 5 pounds of navel oranges, 5 chayote squash, 4 mangoes, over 3 pounds of tomatoes, 3 romaine hearts, and 1 3/4 pounds of both green seedless grapes and red seedless grapes. 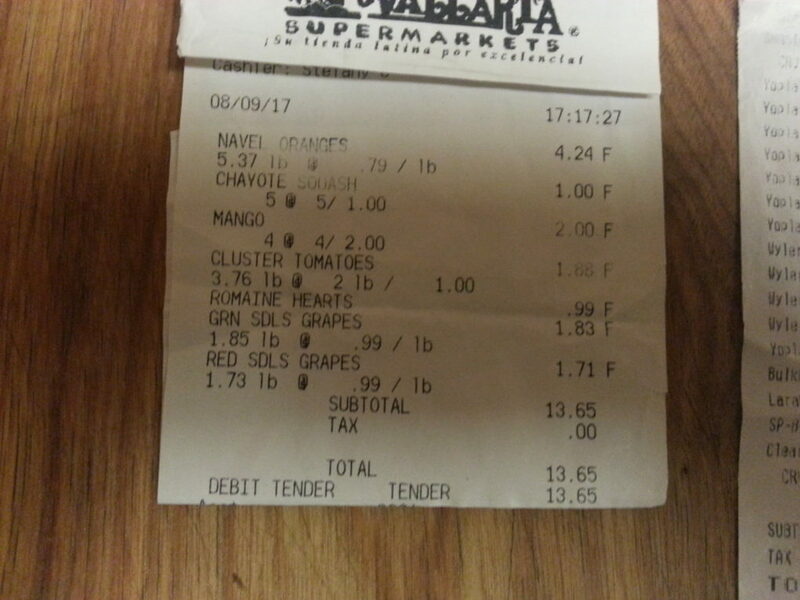 The total spent at Vallarta was $13.65. On Thursday, my regular shopping day, I visited the 99 Cent’s only Store. I apologize for this receipt being so blurry. I will try to do better in the future. I was disappointed to discover that they were out of cottage cheese, so instead, I purchased 8 cartons of Yoplait Dippers–flavored yogurt that came with either cookies or chocolate covered pretzels. I know that Sue Chef will love these. I also picked up some bananas, ground black pepper, some sugar free drink mix, and an entire box of Mint Chip Brownie flavored Lara Bars. Who could pass up 16 Lara Bars for $1.00? The total spent at the 99 Cents Only store was $14.04, but that included a soda that I purchased from my personal money, and a soda that I purchased for my friend who reimbursed me after I checked out. Subtracting those two items from the total spent, left me with a total of $12.21 spent on groceries. Once again, I had gone over budget, but the number was better than last week. I spent a total of $25.86. I was only $0.86 cents over budget. That would have been a successful shopping trip, but unfortunately, the story doesn’t end there. Do you remember how I told you that I didn’t consult my family before going shopping? It turns out that was a problem. Have you ever been told that you shouldn’t go shopping while hungry? It’s good advice, and we should always take it. 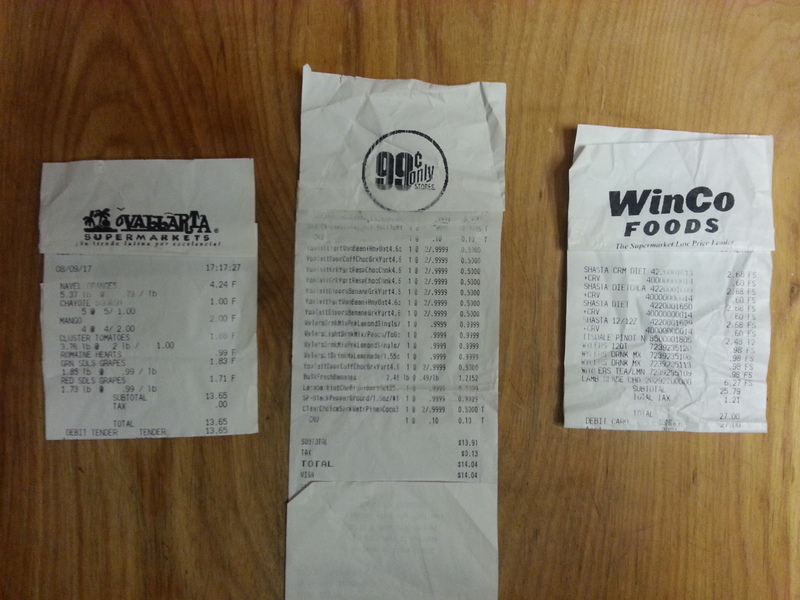 I really do feel bad about all of these blurry receipts. They seem worse this week than usual. Everyone in the family, except Bus Boy, was requesting soft drinks, soda, pop, or whatever they call it in your part of the country. I gave in, and went to the store, on an empty stomach. It was a very hot day, and the air conditioner in my car is broken. I was tired, hot, hungry, and thirsty. I had planned to purchase only one 24 pack of Shasta soda, but I ended up loading four of them into the cart. Shopping while thirsty can be just as bad for the budget as shopping while hungry. 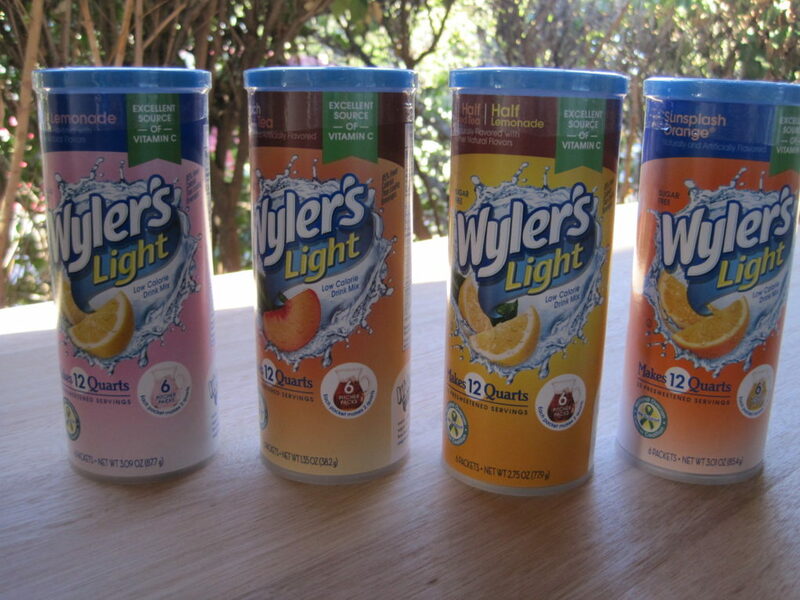 I also purchased 4 more packages of sugar free drink mix. I didn’t need them, but I wanted them because I was thirsty. I headed to the back of the store to look for some cottage cheese since I hadn’t found any at the 99 cents only store. As I was walking through the meat department, I noticed a package of 4 lamb chops that had been reduced in price. I hadn’t eaten lamb in a very long time. I threw it into the cart. Then because I only know one way to prepare lamb, I had to buy a bottle of burgundy to use in the preparation because that preparation requires burgundy, or, in my case, Pinot Noir. I grabbed a bottle and headed toward the check out. Unfortunately, the items in my cart totaled $27.00. 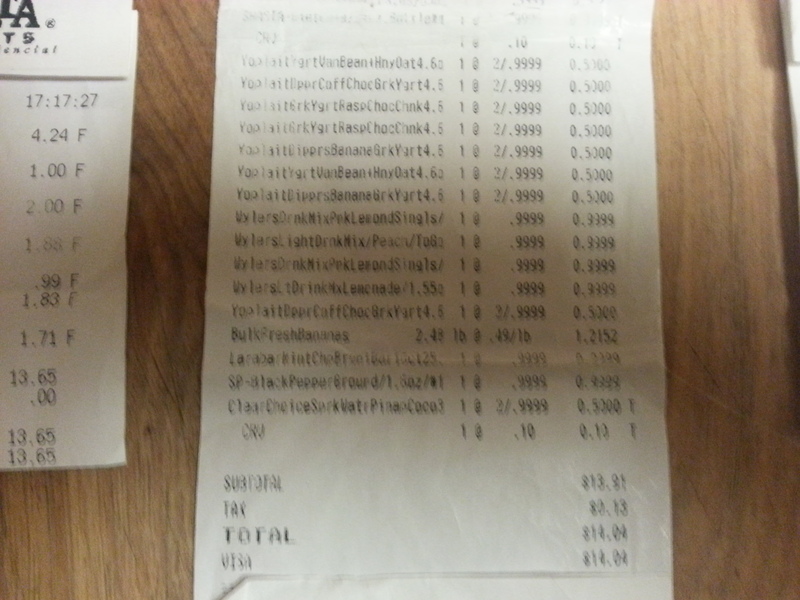 Another really blurry receipt. I apologize, and promise to try to do better. What was I thinking? 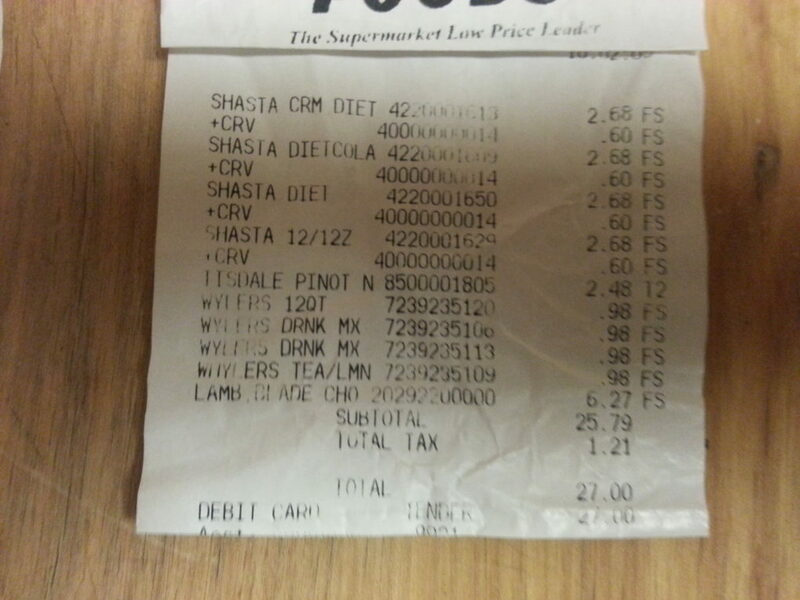 My weekly grocery budget was supposed to be $25.00. Instead, I spent $52.86 this week on groceries. YIKES!!! Now, I’m really thinking I should be paying with cash instead of using my debit card. If I had been using cash, there wouldn’t have been a second trip to the store. What went wrong? There were several mistakes that I made. I didn’t inventory what I had in the house before going to the store. I went to the store a second time after I had finished shopping. Instead, I should have told my family I would buy some soft drinks for them next week. What’s on the menu for the coming week? *Did I mention that the cauliflower that I bought in a previous grocery haul post was HUGE? Hopefully, my adherence to the menu plan will go better than the last two weeks. I’m also hoping that I do much better on following my new grocery budget. I’m trying to keep up with the “fundamentalists” at The Fundamental Home. Of course, when Amanda looked at the receipts I shared on-line during my first week, she noted that many of the items that I purchase cost twice as much for me as they do for her. She also suggested that, perhaps, I should allow myself $30.00 per week which is what she is now using as the basis for her grocery budget. Maybe I should blame my overspending on the cost of things in California. Unfortunately, I know that’s not the truth. The problem was that I didn’t have the right mind set when I gave in and went to the store for the second time. Next week, I plan do better and stay within my budget. In the meantime, I need to stop Sue Chef from writing “Suggestions” on our “Menu” Board. 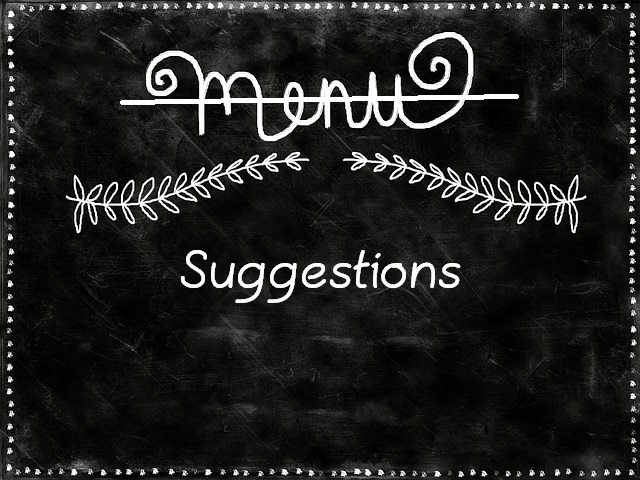 If you have any thoughts, or suggestions, about our menu plan and the $25.00 per week grocery shopping budget, let us know by leaving a comment below. If you’re interested in learning more about how things went during our second week, you may be interested in this post. 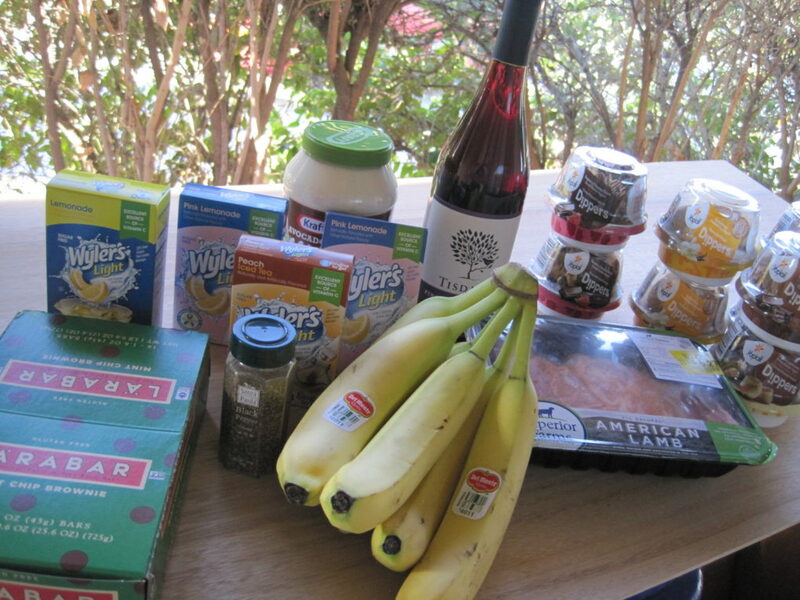 To learn what we did with all of these groceries, check out the post about our third week in review. I just kept thinking that I was going to drink an orange soda over ice when I got home. Then I was thinking, wouldn’t an ice cold pitcher of pink lemonade taste good. I was totally out of control. I have a new rule. 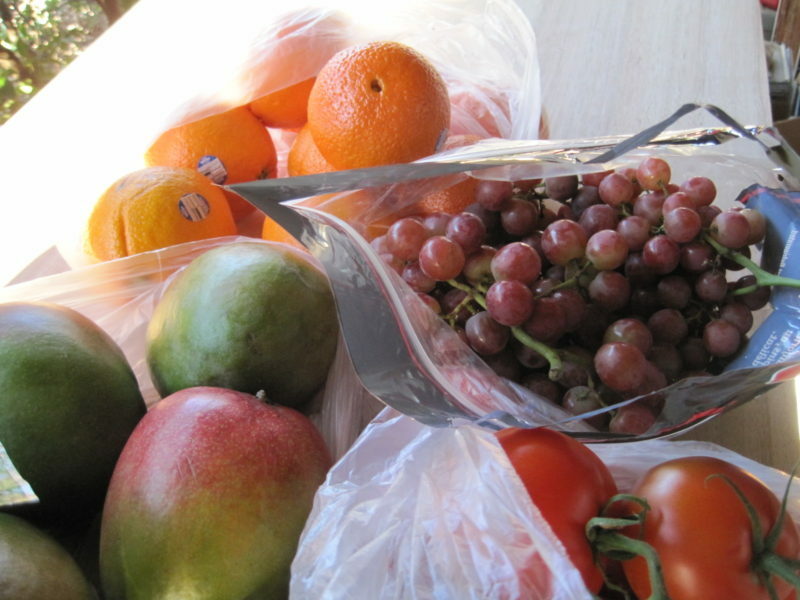 Eat and hydrate BEFORE going to the store.